Listed below are the employees previously featured through the Employee Recognition Program. Visit the Featured Employee website for more information. It is indeed an honor and a privilege to nominate a really hard-working (and unsung) team for ETSU’s Employee Recognition Program. Advancement Services, within University Advancement, is chiefly responsible for data and technology. This close-knit team of six professionals maintains all alumni and donor biographical records, processes all gifts, provides receipts (over 15,000 in 2016-17), maintains gift/pledge account records for over 90,000 alumni, performs research and analysis, develops reports for internal and external constituents, and performs prospect research and management for all assigned fundraisers. They do their work in the background, but their efforts make up the backbone of our organization. Without good data and people with the expertise to accumulate, deploy, and analyze it, our mission would be impossible. Advancement Services is truly the “hub” at the center of our work cycle, collecting data from all facets of our organization and consistently returning high-quality deliverables. This is merely “what” they do. Now, let me tell you “how” they do it, which is extraordinary. Each of these people –Beth Wiley, Asst VP; Donald Harvill, Technology Manager; Cody Greene, Prospect Researcher; Nicole Dowell, Technology Coordinator; and Sherri Harvey, Gifts Processor – perform their duties with a high level of grace, good humor, and professionalism. Theirs is a world of deadlines and timelines and they are always on-target in the face of great pressure. We know we can, and we do, count on them to accomplish the impossible on almost a daily basis. The office that serves as home to Advancement Services is actually a re-purposed vault. This is suitable, because I believe this team and the people who comprise it are this organization’s most precious resources, wholly worthy of safeguarding. Please join me in recognizing them and thanking them for their exceptional efforts! Constance Alexander has been employed in the Office of the Dean in the College of Arts & Sciences for 24 years, working with five different deans. She has provided a level of continuity and she has knowledge of the history of the college that is invaluable. As Office Coordinator, Constance handles all financial matters for the college and she keeps track of literally hundreds of accounts across our departments and centers. She provides guidance for office staff across the many and diverse units within the college, and is a wonderful resource for those who are new to ETSU. In addition to her day-to-day activities, Constance has served on the Staff Senate and on various committees. She takes very seriously her responsibility to be a good steward of the college's resources but is always able to do so with a smile and the all-important sense of humor. Mary “Murry” Andrews has been employed with ETSU since December of 2000. Murry’s job performance goes above and beyond the call of duty as she goes the “extra mile” to assist students. She provides Financial Aid Awareness throughout our campus, local high schools, and city. Murry diligently notifies students and parents about the importance of “Applying Early” for Financial Aid and scholarships. She also seeks departmental and community involvement in the application process. Due to Murry’s hard work, ETSU was awarded special recognition from the National Association of Student Financial Aid Administrators for Creating Financial Aid Awareness in East Tennessee. Murry is also providing workshops at state conferences to assist other colleges in developing a Financial Aid Awareness Program. The Office of Financial Aid and the students at ETSU are very fortunate to have such a dedicated counselor in our midst. Tami Baker is one of the most helpful and resourceful colleagues I have encountered at ETSU. She has the most positive attitude no matter how daunting the task. For example, I have repeatedly brought video footage to Ms. Baker to transfer beyond my camera and onto my hard drive. I know that this task has been a tedious assignment, but she has always remained positive even after hours and hours of transferring the footage. Ms. Baker takes pride in assisting others in the Educational Technology Resource Center. Students and faculty repeatedly comment about the supportive way Ms. Baker assists them with their technological needs. Ms. Baker always makes time for assisting others and she always assists with a smile. I can think of no one more worthy than Tami Baker to received employee recognition. Michele Banner is an Advisor in the Clemmer College of Education and she is amazing! She works closely with students in the college and they are able to reach goals through her guidance. She is respectful, caring, and invites the opportunity to really get to know the advisees with whom she works. She also works closely with 2-year colleges in the area on articulation. She travels regularly to 2-year colleges to advise students on those campuses who are interested in matriculating at ETSU. She is such a wonderful ambassador for our campus. Michele is also an individual who is interested in making the environment in which she works a healthy environment for colleagues. She brings her respect, compassion, and caring to colleagues as well as helps to keep the Clemmer College of Education a place that is inviting and enhancing rather than oppressive. She is a very strong and positive presence in the college and throughout the University. Her skills are outstanding and they make a huge difference and an equal difference is made through what she gives of herself – her heart and her soul. Thank you, Michele, for being with us here at ETSU! Pat Barnett, Registrar Lead Worker, always has a smile on her face and a kind word for students, faculty and staff. No matter how busy she is or how over-multi-tasked she is, Pat makes everyone feel as if they are her first priority. In person, on the phone, and via email, Pat is a joy. She is one of those people at ETSU who can be identified by first name only. Students will say, “I talked to Pat, and she helped me.” Staff will say, “I don’t know what the procedure is, I’d better call Pat.” Faculty will say, “I’d better go ask Pat about that deadline.” Everyone knows who Pat is! When people need help, she gives it. Pat is someone whose word you can believe, all the time, every time. Thank you, Pat, for being with us at ETSU! Lisa Bell is a Counselor in the Office of Financial Aid. She works very closely with our diverse student population to assist them with funds for college here at ETSU. She is sought out as a Counselor to assist minority students with referrals from Stephanie Murphy, Advisor, and Mary Jordan, Special Assistant to the President, because they know of her years of knowledge in the financial aid field and her talent for finding extra funds when available. She has a talent of helping students understand the rules and regulations as set forth by the federal government. If they apply too late for funds, she works with them to teach them the importance of applying much earlier the next year. She attends countless outside programs and workshops for minority students where she is a presenter and encourages these students and families to attend ETSU. Many of these programs are beyond office hours taking place during her weekend family time. She works closely with offices on campus to assist them with their own diversity of students. Lisa designed and maintains the website for the financial aid office. This entails constant updates due to changes in federal regulations and the cycle of activities within the office. She is very diligent in making sure that correct information is reported in a timely and on-going manner to promote awareness of financial aid matters. Even while being a busy wife and mother of two small children, Lisa is now working on her MALS degree. She works hard for our students and our university to encourage diversity and is truly an outspoken advocate in the effort to combat bigotry, discrimination and oppression. Thank you, Lisa, for being with us here at ETSU! I would like to nominate Hannah Rhoades, Jessica Winkle and Drew Howell for their tireless commitment and outstanding support and service. Hannah, Jessica and Drew all work for the Registrar’s Office helping with building courses registering students for classes, training executive aides on Banner, etc. They always send out reminders and helpful information to make our jobs so much easier. No matter how busy they are, they always have a smile and time to help. Hannah and her team will go the extra mile even when they are swamped. At the start of the new semester when they were backlogged with requests, Hannah took the time to help me sort out a problem with a student and assisted the student with registering for her classes. No matter who answers the phone, Hannah, Jessica or Drew, each one represents their department with outstanding customer service and makes working with them an enjoyable experience. Most of their work is time consuming and they are diligent with every aspect. Each one deserves to be recognized for all they do. Beverly exemplifies the true spirit of an ETSU employee. She has a positive attitude and a smile on her face everyday. Working in a high demand area like the Bursar’s Office requires an extraordinary amount of patience and Beverly truly has this trait. She is always kind to whomever she comes in contact with, whether it be a student, parent or a co-worker. She is so easy to work with and everybody enjoys being around her and just stopping by to say “Hi.” Handling student’s accounts can be a stressful job but Beverly always finds a way to finish the day with a smile on her face. Students often mention how great “Ms. Beverly” is and how much they love working with her. The Bursar’s Office and ETSU are very lucky to have such a valuable employee. Brian Bennett is an Analyst III in the OIT department. The University-wide priority of Banner implementation and integration as our campus-wide ERP system created an outstanding opportunity for all ETSU employees to roll up their sleeves and help the cause. One of the biggest assets ETSU has had during this migration and implementation period was and is Brian Bennett. His BS and MS background in Computer Science, paired with an approachable and likable personality made him a perfect fit for one of the first business segments to migrate – Human Resources. Brian was an integral part of the HR conversion and migration team in that he hand-held much of the data conversion and project goal responsibilities, even as a junior member of the project migration team. You can ask anyone involved with the Banner implementation and they will sing the praises of Brian Bennett. As a Programmer Analyst III, Brian can be given a project or task with a minimal set of direction and be relied on to complete the task to the satisfaction of all stakeholders involved. His professional guidance of ETSU Analyst II's and personal involvement with the Banner migration project has settled many a frayed nerve because of his obvious devotion and dedication to ETSU and his responsibilities. Thank you, Brian, for being with us here at ETSU ! Shella Bennett has been employed in the School of Graduate Studies since August of 2006, and every day since then she has distinguished herself for her professionalism, dedication to the unit, and conscientious performance of her job. Actually, I should say jobs, as Shella has a hyphenated title; Program Specialist-Data Analyst, and she performs the work of an application processor, a graduation analyst, a report writer, a data analysis guru, and all-around good person with a smile. Shella is also pursuing a doctoral degree in Education Leadership, and taught ETSU 1000 in the evenings of Fall 2010. The School of Graduate Studies would not function nearly as wells as we do without the graciousness and dedication of Ms. Shella Bennett. As our executive aide for Cross Disciplinary Studies in the School of Continuing Studies and Academic Outreach, Linda Bishop is often our first contact with students. She helps every person who calls. Her concern for helping students is outstanding. She connects students with our department and helps them find any other information they need. Linda is always welcoming, patient, and helpful. As ETSU's first point of contact for many adult students, she provides a positive image and a good impression of our university. Handling scheduling and student workers for our department is a full time job, but Linda is also truly concerned with our welfare and our students' welfare as well. She enthusiastically supports all of our endeavors. She not only keeps the office organized and running smoothly, but also contributes greatly to the schools morale. She is a big part of the team that helps students overcome the challenges of taking classes and ensures that then continue through to graduation. Having a steady friend available by phone is a help and a comfort to students and staff alike. Kim Blevins has worked for ETSU for over 25 years in the College of Medicine , College of Nursing and currently in Academic Affairs. She takes ETSU Pride in her work and is a very dedicated employee of the University. She is one of the kindest, most generous and caring individuals you will ever meet. As a cancer survivor, she does a great deal to help find a cure. Kim works with the American Cancer Society Relay for Life and participates in the annual walk in the Dome as one of the “ETSU Survivors” team. She speaks to medical students about her battle and recovery from breast cancer and what they can do to assist patients with their fears and treatment after a devastating diagnosis. Kim is also a member of the local American Heart Association Board and has for 13 years worked as a team member on the annual American Heart Gala fundraiser. Kim is an active member of Fairview United Methodist Church in Jonesborough. She is also an active community member for the historic “Tree Streets” district. She is a member of the Southside Neighborhood Organization and currently is working with a zoning task force to advocate responsible development of Walnut Street that benefits business owners while at the same time preserving the value and quality of life in the historic neighborhood. Kim works tirelessly for ETSU and many worthwhile causes, both civic and humanitarian. Thank you, Kim, for being with us here at ETSU ! Valerie came to ETSU with a wealth of administration support expertise and puts it to work every day for Surgery and QCOM. Each year Valerie single-handedly organizes the details of a month-long Medical Horizon’s program, now in its sixth year. Valerie’s work begins months before the program starts as –over 120 student applications are received. Valerie reviews each one of them, extracting key information for the selection committee review. Valerie then matches the physicians with each of the students for their “shadowing” experience. The program is completed with Valerie monitoring the completion of evaluations by the physicians and the students. Every task Valerie touches is done with this degree of detail and professionalism. Valerie has a wonderful outlook on life and brings this to the workplace, positively affecting everyone in/out of the department. Ms. Carol Boles and Ms. Nancy Meredith are the two nicest women you will meet as a student. I got the opportunity to work for and with both of these ladies during the Summer Semester. Both of these wonderful women go far and beyond to make everyone feel that they are important. At that time, Ms. Boles was the SORC secretary and handled all of the students with care, as if each one was her child; in fact, I and a few of her other student workers call her our adopted "Mom". Ms. Meredith is the Executive Aide for New Student and Family Programs. With each orientation or event, she is prepared to assist anyone with anything and is appreciated by the student workers for her positive attitude and outlook. And these ladies are good friends. To see them working together or just sharing lunch will give anyone "Friend Goals".Both of these ladies have helped dozens of students, faculty, and community leaders. Personally, they both made my summer; even if I was hit with a difficult situation, I knew I could go to work in an uplifting and caring environment. I believe they should be recognized for their hard work and for their unwavering positive attitudes! JoAnne Boyd is an Executive Aide in Social Work. She was the recipient of the Social Work Faculty Award for Outstanding Student of the Year for 1999 to 2000. She received the ETSU Distinguished Staff Award in Recognition of Outstanding Service and Dedication to the University in 2004. In addition to her duties as the Executive Aide for the department’s bachelor program, she is the Executive Secretary for the Phi Alpha National Honor Society. As a result of her consistent efforts to rebuild this critical national organization, membership has skyrocketed. Phil Alpha has grown from 70 chapters to 368 chapters in four years. JoAnne represented ETSU and Phi Alpha at a national conference in Atlanta and subsequently earned the organization the title of “honor society of choice” on national social work web pages. She has been trained as a peer counselor and has created an ETSU “safe zone” in her office. Her community efforts have benefited agencies while strengthening the ties between the university and the local community. For several years she has helped to raise tons of food and collected clothing for area agencies that serve the homeless population. At her own initiative, she collected cell phones for the Compassion Connection, which will benefit the children’s grief group by allowing them to sell phones to the police, who will then donate the phones to victims of domestic violence. JoAnne also wrote a proposal to the university that allowed computers to be given to agencies in need, agencies who could not otherwise afford the technology their employees needed to complete their jobs. We informally and fondly referred to this worthy endeavor as a “liberate the computers” initiative. JoAnne has been an active member of President’s Pride for the past 8 years. Recently, she was invited to serve on the Cultural Diversity training team. She is the treasurer for the HIV network, and is a facilitator of group therapy for individuals and families with the HIV Aids Virus, and meets twice monthly with POZ, which is a support group for those infected with the virus. JoAnne is a social activist and is an active participant in her commitment to ETSU and the mission it advances. A Social Work student was diagnosed with cancer, and while going through Chemotherapy, was in great financial need. JoAnne collected the necessary money to enable her to have her car repaired, and contacted agencies to have her electricity and rent paid. Another staff member of the university was losing her child to cancer, and JoAnne helped raise money to allow her to survive, when her annual and sick leave ran out, and provided her with a burial plot. While excelling at her job, and her many volunteer activities, she has also managed to earn her Masters degree in Social Work. She is in her last semester, and hopes to be hooded this year. We are thankful every day that we come to work and start the day with a person who is so caring and good hearted and always smiling. Thank you, JoAnne, for being with us here at ETSU! The Department of Communication’s Executive Aide, Judy Branson, is a remarkable person. Judy meets her responsibilities with grace, energy, and humor. Last year Judy Branson performed above and beyond the call of duty, coming in early and leaving late five days a week - and then coming in on Saturdays to finish up the mountain of work - all the while smiling and presenting a pleasant first impression to all who came into the departmental office. AND THEN TBR CHANGED CORE requirements. To cover the new CORE requirement, the department had to add faculty. It grew by SEVEN new faculty and 40% more student credit hours . . . with the same number of administrative support personnel. Judy continued to smile, continued to come in early and leave late; but most importantly, she continued to get the job done. Judy was also instrumental in an assistant professor’s decision to accept a position at ETSU. While the assistant professor was considering an offer at ETSU, Judy coordinated her visit to the campus, arranging accommodations, travel plans, and reimbursements in a timely manner. After the assistant professor was hired, Judy assisted in her transition to ETSU by coordinating a house-hunt, overseeing the purchasing of necessary supplies and equipment, and Judy was ready with all the information necessary for the assistant professor to meet her own obligations. The assistant professor readily states that one of the reasons she accepted her position at ETSU was because she knew Judy was here. Judy continually demonstrates her ability to bring a diverse department closer together. For example, while meeting her daily responsibilities, she -- amazingly -- never forgets a birthday, wedding, or anniversary. Before a special occasion, she quietly collects signatures on cards or donations for flowers. Sadly, the department has faced several tragedies, but Judy quickly notifies all parties and then discreetly organizes the department’s response. Efforts such as these define an organization by creating a warm environment. Judy Branson is definitely a model for all who work for the university, and ETSU is appreciative to have her as an employee. Beth Brennan has been involved in every step of the renovation of ETSU Family Physicians of Kingsport’s new facility. From the first set of blueprints to the massive move to the new location, Beth devoted nights and weekends to making sure the projects was a success. As soon as the facility was near completion, she set up a makeshift office where she worked diligently with contractors and vendors to ensure the timely completion of the project. During the busy time, Beth continued normal job duties and juggled multiple tasks often talking with workers, emailing vendors and receiving phone calls simultaneously! Even during inclement weather, Beth traveled to Kingsport to keep everything on track for the February 24th opening. Luckily, this wasn’t Beth’s first building renovation project! In 1999, she assisted with the planning and completion of ETSU Family Physician of Bristol’s new facility. Beth’s knowledge and experience is valued by the Department of Family Medicine and we are grateful for the dedication she has shown in completing this major project. On February 24th, ETSU Family Physicians of Kingsport moved into a new facility after 30 years at its former location. The Family Medicine Clinic was closed only two business days to complete the massive move from one building to another, which required staff to go above and beyond in order to be ready to see patients on opening day. Not to be deterred by snow days leading up to the move, Department of Family Medicine staff and faculty came together to do any task needed, from packing and unpacking boxes to cleaning and placing furniture, as well as setting up and testing computers. It was truly a team effort that everyone at ETSU Family Physicians of Kingsport can be proud of. The staff takes great pride in the new facility and the moving process has brought the Family Medicine “family” closer together! Angie is the Office Coordinator for the Department of Pharmaceutical Sciences in the College of Pharmacy. She has coordinated the hiring, arrival, and daily duties for eight faculty members in the department. This was complicated from the start, since we all arrived on the same day. To fulfill her unique startup position, she has listened to seminars, processed reimbursements large and small, coordinated moving vans and travel arrangements, and handled nearly every other type of situation that could be imagined from this large group. Angie has always been resourceful and cheerful in doing any of the tasks required for this department. She is a constant reminder of the best of the people of ETSU. She works in many ways, both administrative and personal, to show the determination and effort that helps convert employees into believers in “ETSU Pride” and the slogan “We make this place.” As a constant example of these values, Angie honestly deserves to win a Staff Award nearly every day. Teresa Brooks Taylor has done a superior job with the Service-Learning Program, averaging 1,000 students in 10 to 30 hour community service placements connected to a class each academic year. This involves support of the faculty and their course goals, knowledge of regional community agencies and the people they serve, as well as student support and guidance. This past year Teresa added the supervision of the America Reads tutor program. This corps of 40 undergraduate students serving as reading tutors in the local schools provides much needed assistance to teachers in teaching at-risk children good reading skills. Each tutor received training in literacy education, travels to various assigned schools and spends 30 to 40 minutes with each child. The tutors enjoy working with her and the children receive lifelong skills in reading. We commend Teresa for her work and success in making a difference in so many lives. Thank you, Teresa, for being with us here at ETSU ! Queen Brown, Office Manager in the School of Graduate Studies, is deserving of recognition in the ETSU Employee Recognition Program. Throughout the year, Queen is in charge of processing all contracts for graduate assistants and tuition scholars. The overwhelming majority of these contracts are submitted over the course of a handful of weeks in late July through the end of August. In addition to the herculean task of verifying the accuracy of over 800 contracts, each with multiple fields of entry, Queen also is the point of contact for students, faculty, and staff on the status of this processing. This role leads to lines of people out her office door, dozens of voicemails inquiring about a contract, email so heavy that she is forced to post an ‘Out of Office’ to apologize in advance for any delay in her reply. Despite these stresses and challenges, Queen maintains a positive attitude and a smile for her co-workers; patience for nervous students, faculty, and staff members; and an efficiency born of long practice and an inborn compassion for others. She is a pleasure to work with and we are lucky to have her in the School of Graduate Studies. Deanna Bryant has been a student worker, a secretary, and now an executive aide in the Department of English for approximately 20 years. Using her majors in Biology and Math, she goes far beyond her job description to help the chair with budget planning and budget management. She is efficient, exacting, and dependable in every endeavor in the department. For one of the largest departments on campus, Deanna works on sometimes 2 semester class schedules at a time, keeps necessary records on approximately 40 part-time faculty, and helps the chair assign part-time instructors to about 100 sections of freshman and sophomore classes. Deanna is always here, never complains about her workload, and is currently working on her MA at ETSU in higher education counseling. She certainly deserves recognition for her hard work, dedication, and support to 26 full-time faculty and 40+ part-time faculty! Thank you, Deanna, for being with us here at ETSU! It is with pleasure that I nominate Kristy Buchanan for Employee Recognition. Kristy joined the College of Business and Technology Dean’s Office in 2009 and “hit the ground running.” She began at a crucial time in the college and was instrumental in assisting the college with documentation gathering and processing for our AACSB accreditation. Kristy always has a professional and positive attitude when working with faculty, staff and most importantly students. Whatever the issue, Kristy will always go beyond the call of duty to put the person at ease and find a resolution. She has created a great rapport with students and local employers as she facilitates our internship program, which is only one of her important assignments.Kristy understands the need for flexibility in her position. Many times, she has had to adjust her hours to accommodate activities that occur beyond normal business hours, both on campus as well as off campus. She is willing to lend a helping hand whenever the need arises. She is a great ambassador for both the College of Business and Technology and East Tennessee State University. Kim Bushore-Maki, a coordinator in the Counseling Center, has and continues to have a strong impact upon students in our campus community. Her outspoken advocacy for student survivors of sexual abuse has been most felt in her spearheading of the "Take Back the Night" programs that have taken place for the past six years. She is never complacent in her efforts and continues to build this program. Of particular note is her addition to “Take Back the Night” with a 5K run/walk to collect funds for equipment to be used by the Johnson City Medical Center emergency room when gathering physical evidence of a sexual assault. Kim exudes warmth and strength which are two qualities that sometimes do not go hand in hand. Students regularly say that she is one of the most approachable campus administrators here at ETSU and that her presence in the Counseling Center is valued by many -- students, faculty and other administrators alike. She is especially deserving of employee recognition because she not only fulfills the duties required of her position but is always open to speaking in classes, teaching self-defense, consulting on course materials related to women's issues, and being available during student crisis situations. This is all job performance above and beyond the call of duty. Thank you, Kim, for being with us here at ETSU! Penney Capps is an Administrative Secretary in the CSCI department. In the summer of 2005, when Dr. Martin Barrett, the graduate coordinator, went on sabbatical, and the assistant graduate coordinator was on vacation, Ms. Capps, who was a new hire as of July 1, 2005, effectively ran the CSCI graduate program, with some help from the assistant graduate coordinator by phone and e-mail. She helped in meeting and greeting new students; preparing their paperwork for the GAship's; advising them as to how to get settled into Johnson City; and taking a personal interest in their well-being. She did all of this cold, without complaint, and got it right. Since the assistant graduate coordinator's return, Ms. Capps has continued to serve as de facto assistant graduate coordinator for our rather large graduate program, including GA scheduling work that was previously done by Ms. Rebecca Loyd, as a way of freeing Profess or Loyd to become undergraduate coordinator . She has also tried to boost department m or ale in ways that I have seen no one attempt before, including keeping a bulletin board of department (and other) news, and making a point of organizing periodic potlucks for staff. Thank you, Penney, for being with us here at ETSU ! Little events that happen in our everyday environment are often taken for granted. One such example of this is the daily housekeeping being done by our custodians here at ETSU. In view of this, here is a copy of an email received regarding the quality of work being done by Darlene Carroll and Theresa Hill: ‘I wanted to send you an email in regards to housekeeping. I wanted to let you know that I think Darlene and Theresa have done a superb job on our floor. I have never seen our lab and the bathrooms look and smell so clean. I would appreciate it if you would let them know that we do appreciate all of the little things that are being done.' Thanks, Darlene and Theresa. We all appreciate you and what you do for us. Jeanine Carroll is an Office Coordinator for the School of Continuing Studies . She is an exemplary employee at ETSU. She is always kind, courteous, and helpful. Jeanine is also very knowledgeable about university policies and procedures. She always does her job with very high standards. Not only is Jeanine always available for good help and advice, but she is also always dependable. You can count on her to see that things get done and that they get done the right way! Jeanine puts forth a very positive image for the School of Continuing Studies and we are lucky to have her! Thank you, Jeanine, for being with us here at ETSU ! Kathy Carter is a Child Care Specialist in the Child Study Center . Kathy has been the “rock” in many children's early lives. Kathy comes to work every day with a smile and she is always there to help the children and parents and families at the Child Study Center . Kathy is truly an extension of the family unit in that she goes the extra mile. She attends the kids birthday parties after hours, works on holidays to prepare the classroom f or exciting activities f or the kids and can even dance to the Wiggles at 8 a.m. Most parents can't do that! Kathy has definitely been a major player in helping raise children and preparing them f or school. She takes her job seriously and she loves every child. She has made a difference in many young lives. Thank you, Kathy, for being with us here at ETSU ! Sharon Chandler has served as an Executive Aide in the History department for over five years. Previously, she served seventeen years in the Colleges of Nursing and Applied Science and Technology. She is well-liked throughout the University for her kindness and willingness to help anyone. For Rogers-Stout Hall, Sharon is the go-to person for any assistance needed; a person who is calm, level-headed, and possesses the highest professional standards. Sharon is admired and respected by everyone who has had the good fortune to know her at the University. Many demands are made on an Executive Aide, from office management ability to counselor and mentor to students, as well as having a cool-head to handle the unexpected, which ranges from the humorous, a mouse in the office, to a medical emergency. The bottom line is that neither the History department nor the University could operate as effectively without Sharon, a remarkable person who is an ideal role model for all of those who work at ETSU. Ralph Coffman supervises the microbiology media kitchen and teaching laboratories in the Department of Health Sciences. The College of Public and Allied Health accepts nominations each year for an “Outstanding Staff Award” that is presented at the annual fall college meeting. Ralph is one of the staff members who received the award. Some of his responsibilities include preparing cultures as well as monitoring student experiments. Ralph’s conscientious attention to detail as well as his organizational and problem solving skills help make the microbiology lab a most pleasant experience for faculty and students alike. Not only are his skills appreciated by the faculty and students, but the manner in which he handles himself. He always has a smile, no matter what the request. CPAH is proud of this year’s “Outstanding Staff”! Thank you, Ralph, for being with us here at ETSU ! Laure Craddock is, very simply, the backbone of the central University Advancement Office. You can find her on the third floor of Burgin Dossett performing one of the most challenging high-wire acts in the office. Laure is responsible for greeting and assisting all of our donors, staff, students, and other visitors with a smile and a high degree of professionalism. In the midst of nearly constant interruptions, she consistently goes out of her way to make sure everyone gets exactly what they need. In addition to serving as an information hub for the entire office, she also provides direct support to the Executive Director of Annual Giving and the Director of Development for University Advancement. Laure originally hails from Grafton, Ohio and lived in the Sarasota, Florida area for most of her life. She attended Sarasota County Vocational-Technical Center, graduating with a Certificate in Occupational Office Training in 1976. After spending most of her career at Florida Power and Light Company, Laure came to ETSU Advancement in 2007. In 2009, she earned a Certified Professional Secretary rating from the International Association of Administrative Professionals. Laure and her husband, John, have 3 children and 3 grandchildren, all living in the Tri-city area. I would like to recognize all the Lead Workers of our Custodial Department. They lead our team on a daily basis to maintain our campus at a level we all are proud of. Day after day they deal with different situations but they always achieve the same outcome. All of these individuals provide the university with the most important qualities of an employee on a daily basis, which are pride and passion in their work. I am very proud to work with a group of individuals that are so dedicated to their profession. They have risen to the occasion time after time to ensure all buildings are ready in spite of floods, snow storms or any other challenge. Each and every one of these lead workers is an asset to our university. It is with great pride, appreciation, and heartfelt thanks that I nominate the two staff teams from the DP Culp University Center, and the Campus ID Services for a special Employee Recognition in appreciation for their outstanding efforts over the last year during my extended absence as their supervisor. They have willingly ‘stepped up’ to do whatever was necessary to insure the day to day successful operations of these areas. They have maintained a high level of service to the campus community. New features have been added to both operations, special projects have been completed, staff changes have been managed, and budget cuts endured. Staffs have worked harder, taken on responsibilities they had never had before, attended meetings which they had never gone to, made decisions on their own without the usual consultations, and depended upon each other to get things done. I quickly learned they were up to the task! I knew that they were the two BEST STAFF TEAMS at ETSU! Thank you. The Department of Facilities Management (DFM) encompasses a group of individuals under the Division of Housing Facilities that is highly valued by the Department of Housing and Residence Life (DHRL). This group is the custodial staff at ETSU who work in various residential facilities on the main campus of the university. While there are some newer faces to the group, most of these employees have been with the university for decades while the entire group has 98 years of combined experience. The Housing Facilities custodial staff is a vital component of the DFM and families. They maintain and improve the quality of life for approximately 2,200 ETSU students who live on-campus. They serve in nine residence halls and four apartment complexes. Not only do their efforts comprise the regular academic year, the Housing Facilities custodial staff also provide on-going service in the summer months for camps and conferences, lectures, researchers, coaches and other visitors. The Housing Facility custodial staff does a job that is hardly witnessed but is appreciated by students, parents, the DFM, the DHRL, and the university. The DHRL is grateful for the reliable and committed work of the custodial staff within the residence halls and apartments at ETSU. Debbie Donaldson has served as the Human Resource Technician for the Military Science Department for almost 30 years. A native of the area, Debbie is a proud BASA supporter and can be seen with her family at almost every ETSU athletic event. Debbie’s role in the program is critical in ensuring that Department of Defense pay and benefits, to include scholarship funds, are issued in a timely manner to the Cadet/University. Debbie handles all administrative actions required by the Army to include the management of our Cadre professional files as well as the lengthy administrative requirements to bring a prospect into the program as a Cadet. Based on her experience and length of service here at ETSU, Debbie is another who has been instrumental in assisting our newly assigned military personnel as they transition and adjust to life on a college campus. Day in and day out, Tom is always here, always with a smile, and always willing to help his staff and students. He is a rather new employee and has already been promoted due to his excellent work ethic. He has been asked to perform even more job duties than he was hired for, and he is still performing at an above average rate. He is a great boss to work for, very flexible and easy to talk to, and I feel he should be recognized for doing an outstanding job. Ms. Nicole Douglas is such a wonderful ""find"" for the department of Human Development and Learning, the Clemmer College of Education, and East Tennessee State University!!! She does her 'job' of executive aide in our department in an outstanding fashion and I would like to 'speak' about her noteworthy involvement beyond her job description. Ms. Douglas is very interested in learning and as faculty in HDAL went through the FTL (Faculty Technology Leadership) course (two semesters -- 6 graduate credits), she would talk about how she would love to have that kind of experience. It was arranged for her to enroll in the course and she served as a ""pilot"" member for staff at ETSU. She went into a course that was exclusively faculty and did a wonderful job! I know it took great courage for her to do this and she was an excellent addition to that faculty cohort! Ms. Douglas also volunteered to be a diversity educator on campus. She participated in 22 hours of diversity training so she could be a diversity educator and she has served in that capacity over the last year -- helping to implement the 6-hours of diversity education that is being offered to every ETSU staff and faculty member. Ms. Douglas is an EXCELLENT employee, a compassionate and dedicated individual, and we are very proud to have her as a colleague. Thank you, Nicole, for being with us here at ETSU. Lori Doyle is an outstanding employee. She has been with ETSU for 13 years and is essentially the glue that holds the Center for Early Childhood Learning and Development together. She knows how everything works in the department and can answer almost any question. She knows the people to go to in order to get things completed. She is very thorough and dependable. Her job performance is definitely above and beyond the call of duty. Not only is she a devoted Full Time ETSU employee, but she also takes classes in Accounting and maintains a household that includes her husband and a daughter. She is always caring and polite. She is also very pleasant to be around and work with. Thank you, Lori, for being with us here at ETSU! "Help! My computer is on the blink!" Can you help me? Does this happen to you? ETSU's Help Desk professionals are available to get you out of the jam. With employees like Stephen Church and Dustin Fawver who are knowledgeable, professional, and friendly, the problem can be solved. Stephen and Dustin are the kind of employees who go above and beyond the normal call of duty to assist employees and students in need. Their patience, ability to relate, expertise, and desire to help you fix your problems make them a step-above the norm. Thanks, Stephen and Dustin - we CERTAINLY do appreciate you! Patricia Elledge represents all the best qualities in a person to work with. She is warm, kind, friendly, understanding, caring and thoughtful. As the primary secretary for Tennessee’s Early Intervention System, Center for Early Childhood, Patricia is the first person most of the callers hear on the phone or meet as they enter the building. We are a program for infants and toddlers with special needs and their families. Often family members must take a difficult, emotional call to refer their child to us for services and they are always greeted with care, compassion and excellent information. In addition, Patricia is super organized: she handles all of the referrals, keeps up with the comings and goings of 12 full time staff, manages infinite correspondence related to records and services for our almost 400 children and their families, supervises student workers, orders supplies, is the building coordinator, acts as recorder for many meetings, does many other things, and in spite of all is always calm, cheerful, and professional. She comes early and stays if needed. She pitches in whenever anything is needed and remembers most of what we all forget. We just couldn’t do without her! Thank you, Patricia, for being with us here at ETSU ! Lisa Elliott is an Academic Advisor with ETSU at Kingsport. She does a wonderful job advising students at off campus sites in Bristol and Kingsport. Her warm personality and knowledge of careers make her the kind of advisor that students feel very comfortable coming to see. Working at an office campus center makes her duties more difficult at times but fortunately Lisa has a good network of colleagues on campus that put students first and assist her when problems arise. Lisa's positive attitude and willingness to “go the extra mile” make her a truly outstanding ETSU employee! Thank you, Lisa, for being with us here at ETSU ! Robin English is a Lead Cashier in Financial Services. She is always in a good mood and laughs at everything. She is very nice and makes everyone feel right at home. She is liked by all who know her. Thank you, Robin, for being with us here at ETSU! When the doors open each morning at ETSU Family Medicine, Michelle Goodman, RN, Nurse Supervisor is there greeting employees, residents and faculty physicians as we ready the center to provide Patient Centered Medical Home care to our patients. As Supervisor, her door is always open as she is known as our “go-to” person. She is welcoming, patient, helpful, and just an overall exemplary staff member. She regularly rolls up her sleeves and assists the patients, physicians and residents by taking vital signs. She is our first line of defense for emergencies, safety and assistance. She provides a teaching atmosphere and sets an example for our nursing staff and residents by demonstrating effective communication skills with the healthcare team. Her compassionate and positive attitude is evident as she truly focuses on the care and treatment of our patients. She often worries about patients who may be having a difficult time and will call them after hours to see if they are doing okay. Her staff also experiences her care and compassion as she daily assists them, fills in for them when family emergencies arise, encouraging and supporting them, and providing the tools and information needed so they can be successful in their job roles. It is a pleasure and an honor to work with Michelle and we are so grateful to have her here at ETSU Family Medicine! It is my privilege to nominate Ms. Gray for Featured Employee recognition. While serving as the Records Coordinator for the University Advisement Center, Ms. Gray goes far beyond records management. She serves as the backbone of our office organization and coordinates our student advisement efforts. Beyond managing student records and Banner input, Ms. Gray coordinates student testing needs for our student worker staff on a year round basis. During the summer months, she handles the mammoth task of coordinating New Student Orientation for our office. This requires her to maintain a mountain of paperwork and organization to pull off a successful orientation for our office and the student’s we advise. This is even more impressive given the large number of students (approximately 170) we see at each orientation. Ms. Gray has done an outstanding job with all of the orientations and we could not do it without her. She seems to be everywhere at one time in our office during these summer months. During these orientations, Ms. Gray spends time with the students while they are waiting for advisement. At a stressful time she reframes the situation. In her own special way, Ms. Gray changes the atmosphere, entertaining the students with information to help them relax so they may have a successful academic advisement experience. She is wonderful with our new students offering insights to help their freshman year be successful at ETSU. She does everything she can to help students in our office rather than sending them to other locations. She does her job beyond our expectations and we appreciate her attitude and energy in our office. Ms Gray is wonderful. It is my pleasure to nominate Sean Morris and every member of the Grounds and Landscaping team to the Employee Recognition program. The reasons surround all of us - Faculty, Staff, Student, and Visitor. No matter the season, this group of outstanding, loyal, and hardworking women and men keep our campus grounds in superb condition. This is my favorite time of year, and they are outdoing themselves this Spring and Summer. The lawns, plantings, groundcover, trees and shrubs provide such natural beauty as to lift the spirits of all who walk the campus. It is a pleasure to watch them industriously maintaining our park-like environment. As I cross campus and encounter members of the Grounds team, they are courteous, thoughtful of cars and pedestrians, and always reply with a cheerful smile or wave when greeted. Thank you all for your dedication and the important work you perform. Your love for your work blooms and thrives at every turn. Keep up the amazing commitment of making our campus so beautiful and welcoming. Angela Haire serves as the glue that keeps the Military Sciences Department running smoothly. In addition to the typical duties associated with an executive aide, to include managing the schedule and calendar as well as managing the budget supplied to the department from ETSU, Angela fills a number of other instrumental roles. She serves as the perfect liaison between the two worlds that exist in the ROTC Department, the military chain of command and the University leadership. She has assisted me as the new Chair beyond measures as I have worked to learn the many personalities and procedures that are present on a University campus. From twice a year Commissioning, Hall of Fame induction, Dining In and Military Ball event, it is Angela that flawlessly organizes the staff, mentors our Cadets, and coordinates with the relevant on and off campus contacts to make these events happen. Dr. Dennis Hamm personifies the “positive attitude and image of the university” that is part of the criteria named in the description of the Employee Recognition Program. He advises hundreds of students each semester as a professional advisor for Arts & Sciences, working in the Advisement Resources & Career Center (ARC). He specializes in advising criminal justice students, but also assists a variety of students majoring in other programs. He also teaches courses in the Department of Criminal Justice & Criminology. Walking anywhere on campus with Dr. Hamm means never having the opportunity for a complete conversation because people approach him at every turn, glowing with happiness at the chance to interact with him. He gets hugs and/or handshakes from all, and he greets everyone with sincere glee. He is always quick with a joke and quicker with a laugh that disarms any awkwardness or hesitance on the part of the students, staff, or faculty. Warm embraces often occur when he meets security personnel, who always cross the street to speak with him. Without question, no more beloved person than Dennis Hamm works at ETSU. People love him because he loves them. He genuinely cares about how their lives are going. He serves as a role model for all of us at ETSU, demonstrating every single day how important a positive attitude is in daily living. Ron Haney is a Custodian with Facilities Management. During an employee's recent medical emergency, Ron assisted the local rescue squad. He remained cool and responded immediately to the situation. In our book, Ron is the “Hero of the Month.” Thank you, Ron, for being with us here at ETSU! Lakie Hensley is an Area Coordinator in Housing. She is a compassionate person who takes her job at ETSU very seriously. She places the students safety and welfare foremost in the responsibilities of her job. She never expects recognition or accolades for her service to our students and the University. Recently, she saw a student's need and immediately used personal resources and began to seek assistance from the community to address the issue and meet the need. She takes pride in serving the University on various committees and projects. She projects a good image for the University that reaches out into the surrounding community and businesses. She is most considerate of her peers and ready to lend a helping hand when needed. She is truly an asset to the Department of Housing and Residence Life, which is much stronger because of her loyalty and commitment to being the best Area Coordinator that she can be. Thank you, Lakie, for being with us here at ETSU ! Two employees in the Career Placement & Internship Services office have been of major importance as a team to operationally develop the office capability to provide ePortfolios for our students. An ePortfolio is an electronic method of sharing career related materials in a cost effective way through the internet or on a disk. Mrs. V. Jeanette Hill, Information Research Technician, and Mr. Calvin B. Purvis, Assistant Director have developed the ePortfolio concept to empower students to plan and develop electronically documented educational development, learned technical skills and relevant competencies. They have built methods and established standards for selecting and recording career skills to provide employers with documentation that ETSU graduates are ready to make effective contributions to the work place. The finished products have become the method of measuring the outcome of this effort. These two valued employees have a willingness to work with, and help, students. They are willing to give of their time to solve student-related issues. The on-campus, as well as the off-campus, communities have gained considerable respect for their knowledge of emerging technical trends and their applications for the career needs of students. They have gained employer and peer respect. These characteristics make Mrs. Hill and Mr. Purvis attractive candidates for the outstanding ETSU employee recognition. Christy Hoffman is the Clinical Safety Supervisor for Allied Health Sciences' Dental Hygiene program, housed in the College of Public and Allied Health. She began employment in the College as a secretary eight years ago and her exceptional job skills and dependability have allowed her to advance to her present position. Christy is valued in Dental Hygiene for her reliability and for her willingness to routinely adjust her work schedule to meet the needs of practicing students and operation of the Dental Hygiene Clinic. In addition to being well liked by the students, staff, and faculty, Christy's work has been recognized as a model for the University. In a May 2006 Health and Safety Inspection Report, inspectors for ETSU's Health and Safety Office commended her exceptional work as OSHA coordinator. The report stated, “This clinic could be used as an example of OSHA compliance in a clinic setting. It is obvious that the personnel maintaining these labs care greatly about the safety of students, staff, and patients.” Her professionalism and caring are assets to the department, college, and University and are key to successfully maintaining a quality training clinic for the Dental Hygiene program. Thank you, Christy, for being with us here at ETSU ! It is my pleasure to nominate Kasey Hommel for recognition for the “Exceptional Employee of the Month”. Since my arrival at ETSU as the Dean of Education, I have observed Kasey on numerous occasions and find her to be a professional who consistently combines performance and creativity with a cheerful demeanor. Her ability to reflect on complex problems, assess and integrate new ideas into her existing operations, and recommend fair and creative solutions to budgetary issues shows remarkable adaptability and flexibility. She has built strong relationships, based upon mutual respect, with a very diverse staff and faculty both within the college and across the university. She has consistently portrayed a cheerful demeanor, which is only surpassed by her eagerness to help others who come into her office, especially students. I would like to submit Officer Cliff Hudson for recognition as an exemplary employee, but more importantly a fantastic example to our students. He somehow manages to make real connections with 500+ K-12 students and staff at University School. All the kids know and love him. He leads the chess club and took on the gaming club after school as well. I have seen him at ball games in all weather and most importantly always with a smile. His kindness and easy going nature with all our students endears him to our staff and parents. I know that if I have concerns about safety that he will take them very seriously and that gives me immeasurable peace. He goes above and beyond all the time and is the hardest working person at our school. Officer Jerry Hughes is a standard bearer of ETSU Pride! He goes about his job of promoting our University to everyone he meets. He has implemented several State of Tennessee initiatives and has given 150%, thus perpetuating and reflecting our desire here at ETSU to be involved in our local communities. He has positively impacted the Tri-Cities, the Tri-State region, and the whole state of Tennessee. He is involved in Click It or Ticket and Booze It or Lose It, which are multi-law enforcement campaigns involving area police. He is also involved in local anti-drug efforts, such as ETSU BADD and the collaborative youth effort involving Boy Scouts of America and Learning for Life, which eventually became a joint effort between ETSU Department of Public Safety and University School (Law Enforcement Explorer Post 7713). The Explorer Post keeps statistics on our community seat belt use and has been involved in all of the on-campus traffic road blocks over the last several years. Hughes is committed to making campus a safer place. Kim has worked hard in her job to provide technology in the classroom. She receives funding from the Student Technology Access Fee to create ‘smart’ classrooms and to build and replenish computer labs. The students and faculty have learned to use this technology to help in the education process. Each summer, Kim has a very limited amount of time to coordinate and schedule these implementations. There are always too many tasks to do and never enough time but Kim can always be relied on to get the job done. Currently, ETSU has 155 ‘smart’ classrooms and by the end of this summer, will have 170. When Kim started in this position, we had 7. Her hard work, determination and attention to details make ETSU a better place for all of us. We are proud to have her as a member of the Office of Information Technology. Myra Jones is a Technology Development Coordinator in the Office of Information Technology. She is an extraordinary employee. Anytime there is a problem with blackboard or if there is a question on how to use Respondus, she is always willing to help. She has been emailed with problems at all hours and she always answers back as soon as possible. Her attitude is always one of support and she is positive about any problem. She is smart, personable, and tireless. We just can't say enough about her! Thank you, Myra, for being with us here at ETSU! Barbara has saved us hours of time over the years by troubleshooting the problems we have had with databases, websites and other IT dependent projects. Recently she exceeded our expectations by helping us through the transition into Content Management System for our newsletter, while she was facing major challenges of transition in her own department. While helping us, Barbara remained calm, resourceful, and attentive as if our problem was the only one she had to face that day. As always, she enabled us to meet our deadlines. I am pleased to have the opportunity to tell the campus community about the outstanding contributions of Sue Knoche to the community and to librarianship. Sue has worked with the American Cancer Society (ACS) Carter County Relay for Life since 2006. She was Mission Delivery Chair from 2008-10. In this capacity she researched information about cancer research and new therapies, which she presented to the community. She is Recognitions Chair for 2011/2012. Since 2008 she has also worked with the Cancer Action Network (CAN); a grass roots advocacy program to present statistics or legislative ideas on behalf of the ACS-CAN organizations. She entered the ACS Inner-Beauty Pageant in 2011 and was top winner in the Expression category. She was recognized in 2011 by the Museum at Mountain Home for more than 17 years of volunteer services. Sue is also very active in local and regional library associations. Beginning in July 2012, she will become the Tennessee Library Association (TLA) representative to the Southeastern Library Association – the first library staff person to hold that position. In May of 2011 she was a member of a TLA delegation to Legislative Day in Washington D.C. and visited Senators Alexander and Corker and the Tennessee members of the House of Representatives to bring library issues to their attention. Sue also contributes a regular column for "Associates," which is an international online publication for library workers. John Kroll is the definition of ETSU Pride. Every day, he meets guests at the CPA with a warm greeting and a friendly smile. He has never been late, and is always a few minutes early. He is cordial, kind, friendly, and most of all, a professional. Whether he is working with a novice or a specialist, John Kroll treats everyone with the utmost respect. He demonstrates incredible patience in answering questions and helping individuals develop a workout routine geared to their specific needs. With his suggestions and support, Kroll compels the people who are weary of the gym to enter with confidence. John Kroll truly epitomizes the type of individual that ETSU wants representing the university. Vicki Ledford is a Secretary with Little Buccaneers. She is the caulk that holds the many bricks of Little Bucs together. She always makes sure everyone has their paperwork turned in and does all of the payroll for over seventy student assistants. She is so nice to the students. If they forget to turn in their time sheets, she tracks them down and reminds them so that they can get a paycheck. She always helps people who call in to find subs when possible. She is truly an asset here at Little Bucs and is several people's right hand. We just don't know how we would get by without her. Thank you, Vicki, for being with us here at ETSU! Katherine Libby, Rebecca Tolley-Stokes and Jean Flanigan are Associate Professors in the Library Administration Department. They were responsible for volunteering to assist the University Advisement Center with advisement of students who had not declared a major during the new student orientations. They participated in the training and advisement of students. They were the faculty members who had the idea of assisting the center with advisement. They expressed a sincere interest in student success and wanted an opportunity to interact with the students outside of the traditional library setting. Advisement of students is not part of their regular duties in the library. They just really wanted to help them. We would like to recognize their generous contribution and thank them for caring about the success of our students. Their willingness to assist with the advising process exemplifies the university’s values through and through. Thank you, Katherine, Rebecca and Jean, for being with us here at ETSU! Heather exemplifies the ETSU spirit through her commitment to student success and retention. Over the course of each year, and specifically during the summer, Heather personally mentors over 70 student leaders. Those leaders impact the lives of thousands of new students at the University each summer through Orientation and Preview. Her commitment to the success of Orientation and Preview is unparalleled, and that dedication is evident in everything she does. ETSU is fortunate to have such a caring, hardworking, and professional in the Office of New Student and Family Programs. Janet Lightner has worked for ETSU as a laboratory technologist for over 20 years. She has a great knowledge of research techniques including those required for molecular biology and animal research. She is always happy to help anyone who stops by her lab in any way that she can. She is a great resource for information about the College of Medicine and works hard to perform experiments, maintain cell cultures and assist others in the lab. Janet should be recognized for her valuable contributions to ETSU. Kim has worked in the Dean’s office for a little more than one year. Prior to that, she was a temporary aide in the Office of Practice. In the time that she has been working in the Dean’s office, she has provided the College with a “breath of fresh air.” She is always friendly with a smile for everyone that she encounters and I have witnessed her telling the faculty that she is here to “make their day better.” She often goes above and beyond. For example, this summer she asked Facilities for some blue paint that is on our walls in Nicks Hall and she went around the building and touched up all of the areas where there were marks on the walls. She is also creative and has worked to make the environment around Nicks Hall better through signage for directions to offices and classrooms and murals to illustrate the accomplishments of faculty, staff, and students. She has also started fund drives for Bucky’s Food Pantry and the CON Day Center (a clinic for the homeless). In a short time, Kim has become an integral part of this College and someone that I look forward to interacting with on a daily basis because she makes my day better. I have worked closely with the Advancement Services group for several years and have watched it become a more cohesive unit during that time. Ashley Martin, who came to the unit a couple of years ago, helps to advance his office in many ways. He consistently demonstrates an excellent work ethic that goes far beyond his job description. Before his arrival, the position was predominately data entry. Now, Ashley serves on various Banner committees, produces internal and external reports, works closely with OIT to perform program testing, and consistently looks for and corrects errors. He often suggests and implements good ideas that improve the quality of his own work and the work within the Advancement Services group. He always maintains a courteous and professional demeanor in every situation. Ashley is an excellent colleague who deserves recognition for his accomplishments. Don McCarty has earned recognition from the In-Plant Printing and Mailing Association (IPMA) by achieving the designation of Certified Mail Manager (CMM). This credential is the highest honor of professional achievement available for in-house printing managers. Mr. McCarty has attained this prestigious recognition by completing a minimum of five years of print management experience, displaying high moral character and an attitude of professionalism, as well as successfully completing a comprehensive and in-depth examination covering both the business and technical aspects of in-house printing management. In order to maintain certification, he must continue a program of professional development over successive five-year periods in the future. Peggy McCurry is an Office Coordinator in the University Advancement office. She is an exceptional employee. She is the type of person that works until the work is done and never complains. Peggy has served in the department taking on additional duties daily as the department has been short staffed. She has happily and willingly assisted six people instead of two and completed her work and administrative duties. Peggy is a devoted, loyal person who enjoys perfection and serves as a role model for everyone. Her continuous smile, soft heart, and uplifting words demonstrate her faith and convictions. Her work ethic is above reproach. She is a valuable team player and we commend her and thank her for all that she does. Thank you, Peggy, for being with us here at ETSU! Renee is the faculty recruitment coordinator for the department of Internal Medicine. She not only serves as recruiter but has many other duties within the department. Renee goes above and beyond her job duties. Many times you will find Renee speaking with a potential candidate while at home cooking dinner for her family. Many candidates have said “Renee is one of the reasons why I choose to come to ETSU Quillen College of Medicine.” It is her attention to detail, her cheerful personality and her dedication that has made her such a successful recruiter. Renee has recruited some outstanding faculty members to the department of Internal Medicine. She always portrays ETSU in a positive matter. A big Thank You to Renee for her contributions and enthusiasm to the ETSU Quillen College of Medicine. Donna Miller is truly an extraordinary employee. Since coming to the Office of Academic Affairs, the efficiency and turnaround of fiscal paperwork has improved significantly. What makes Donna even more special is that no matter how busy she is, she is always pleasant and professional. If paperwork is turned in with errors, Donna takes the extra time to train the individual completing or reviewing the paperwork in an attempt to ensure it is properly completed the next time. She has a tremendous level of consideration for not only proper procedure but morale of everyone with whom she works. She has become an intricate member of the team, and everyone is most impressed with her abilities, her knowledge and her calm manner. Donna has been with ETSU for almost 14 years and has not wavered in taking her work very seriously. She has been a member of the Staff Senate and made significant contributions through that venue. She will continue to make contributions that promote a positive working environment. Donna has been a real blessing to this office, and always falls back on her faith when times are a little rough. The peace she has within is reflecting outward to everyone with whom she comes into contact. Donna deserves recognition. Mr. Mitchell has been a wonderful ETSU employee. This man took the time to sit down with me on many occasions to settle disputes or just to put my mind at rest. I know that I am not the only student leader or student for whom he has made this effort. Mr. Mitchell makes everyone feel welcomed and happy, all the while he still holds authority in a well-mannered way. He deserves to be recognized! Angela Murray is a Certification Analyst for the College of Education. Most of you know Angie, but many of you have no idea as to her job description outside of knowing she has something to do with helping people get their teaching licenses. A person certainly does not have a complete understanding of her job until they have worked with her for a while. What most people don’t know is that Angie is the College of Education’s best-kept secret and that she does an extraordinary service for students and for the college as well. Angie’s primary responsibility is to process paperwork necessary for students to receive their teaching licenses. This seems to be a rather benign task, but I know from direct contact with her, that the process isn’t as simple as one would like to believe. Angie works with both baccalaureate and post-baccalaureate students pursuing licenses. There are more licensure options than one might perceive. Because there are students with very unique situations inquiring about licensure, Angie is often the person who advises them as to what criteria is necessary to obtain licensure. Angie, being the detail-oriented person that she is, is not satisfied with giving students superficial information. Instead, she spends a lot of time helping students to “sort out” their situations and provides them with appropriate information to facilitate their licensure pursuits. She has said a number of times ‘If I don’t help them, who will ?’. She is committed to giving students the best service. With the unique student situations, come the necessity of working with faculty and administrators in the college and with faculty from other colleges at ETSU. She has developed an excellent rapport with faculty all over the campus. The faculty respects her for her expertise in guiding them through licensure issues, as often times they are not knowledgeable about the licensure requirements. Angie’s twenty-one years of experience and the history she has with the college are irreplaceable. Many times individuals have been in meetings and she has referred to situations or policies that many of us have forgotten or never knew. Additionally, Angie is on the Teacher Education Council and contributes her licensure knowledge to a process that most see as an institutional situation. She always links institutional requirements to state requirements, putting the information in a much broader, but more inclusive perspective. How would anyone know about Angie and her expertise ? Well, many people never will be in contact with Angie, as there would be no need. Ask people who do have contact with her though, and you will find words or praise and respect. We believe it is time for the university to give back to Angie just a fraction of what she has given to everyone by recognizing her accomplishments and expertise. Thank you, Angela, for being with us here at ETSU! Lynn Myers is a Grant Accounting Manager in the Comptroller’s Office. He is a fantastic employee. He keeps track of the grant accounts, and is extremely helpful and knowledgeable. Whenever anyone has a problem with their accounts, he is able to fix it immediately. He works very long hours; he answers emails in the evenings and over the weekends. He has helped with many different problems, for example, with payments for summer Teacher’s Workshops and summer salaries. He is very deserving of recognition. Thank you, Lynn, for being with us here at ETSU! Robert Nielsen is a Systems Manager and David Robinson is an Assistant Systems Manager in the Computer & Information Science Department. They are truly a team in all respects of the word. In general they are the backbone of the Computer & Information Science Department, supporting all of the hardware, networking and software needed to teach students and do research. They work diligently to accommodate what has to be the most demanding group of faculty and students on campus in terms of computer needs. They both frequently go above and beyond the call of duty, working extra hours and long weekends. When a problem occurs, they do not stop working until the problem is fixed, no matter how long it might take. In addition to this well established record of service, these two men recently undertook one exceptional project. Jointly they oversaw the relocation of all the computing equipment from the department's old quarters in Gilbreath to the new location in Nicks Hall. This required relocation of more than twenty faculty machines and the set up from scratch of three new teaching labs in Nicks Hall, along with the total refurbishment of four labs in Gilbreath for use in teaching the 1100 course. No job escaped their notice, from computer and network setup, to software installs, to cleaning of labs, to the repair of tables and furniture. Thanks to their efforts, ALL of the teaching labs were ready to go before the first day of classes, and the entire faculty had a chance to try them out in advance. Thank you, Robert and David, for being with us here at ETSU! The Museum of Natural History at the Gray Fossil Site would like to nominate April Nye for her outstanding job performance over the years. April has been involved in the Gray Fossil Site and Museum since its beginning and has taken on many critical roles that have led to its ongoing success. Her role evolved from volunteer to Graduate Assistant and Assistant Collections Manager to Operations Manager. In her most recent role as Operations Manager, April has led the away in museum financials, Safety and Security planning, gift shop oversight, and general operations. During this time April played an essential role in preparing for a museum assessment by the American Association of Museums, where we received an outstanding evaluation. The Museum is now in another state of transition as it partners with the Hands On! Museum, which now leads the educational operations and visitor experience component. April is already leading the way in the partnership as a liaison between the two entities, and is committed to move the ETSU Museum toward accreditation. We applaud April for her work ethic, professionalism, and ongoing commitment to the Museum and ETSU! We are nominating Ms. Laura Parsons, Forensic Operations Administrative Supervisor at the ETSU WLJ Forensic Center (WLJFC), not only because she is an exemplary ETSU staff member, but also because she serves a crucial role in the community. Her role as a primary death investigator and liaison for family members and friends of decedents, law enforcement and investigative agencies such as child protective services, and legal representatives for eight counties has enormous impact. Fortunately, due to her unmitigated dedication and tenacity for service and improvement whenever possible, the impact is profoundly positive. Notably, Ms. Parsons is one of the only two ABMDI (American Board of Medicolegal Death Investigator) certified Death Investigators in the entire state of Tennessee. The WLJFC performs forensic autopsies and serves the eight counties that make up the TN First Development District. Performing a death investigation involves gathering information for the bereaved, often overwhelmed family members, gathering pertinent medical records and recognizing suspicious circumstances. In this role, she serves as the primary liaison between families, law enforcement, healthcare providers, coroners, medical examiners and attorneys at law and the WLJFC forensic pathologists. She is the frontline individual who calls bereaved family members, gathers investigative information and provides comfort and direction to grieving and overwhelmed loved ones. Her dedication in the face of an increasing workload, a new facility and new accreditation standards has resulted in successful expansion and delivery of services to the community. Chuck Patton recently assumed the position of Executive Aide in the Department of Environmental Health. The College of Public and Allied Health accepts nominations each year for an “Outstanding Staff Award” that is presented at the annual fall college meeting. Chuck is one of the staff members who received the award. Faculty and students in the department are pleased with Chuck’s enthusiasm, motivation, willingness to go the extra mile, all while promoting PMA (Positive Mental Attitude)! A retired Marine NCO, Chuck has brought leadership skills and organizational talents to his position that allows the faculty to concentrate on their teaching, research and service roles to the university. He never comes up against an obstacle that he can’t get around, all the while working to promote good relations with his colleagues. CPAH is proud of this year’s “Outstanding Staff”! Thank you, Chuck, for being with us here at ETSU! Gail consistently handles a difficult position well: one that requires her to help evaluate our incoming students admission requirements; to track our students conditions of admission, probationary status, progress towards graduation, and all associated paperwork; and to handle a variety of special circumstances, like pending dismissals. She consistently treats questions and concerns as top-priority concerns, and expedites paperwork and inquires at need. What impresses us about her work, is imagining her doing this for how many other departments? Thank you, Gail, for being with us here at ETSU! Rita Presnell has been a part of the university for over 35 years, and her name is synonymous with the College of Business and Technology. Rita is Office Coordinator to the Dean in the College of Business and Technology where her role has changed considerably over the years. She has not only adapted to all changes but has provided leadership to the rest of us. Rita has played a huge part in making the recent merge between the College of Applied Science and Technology with the College of Business a success. Her responsibilities have increased in the larger College of Business and Technology, but she has taken everything in stride. She defines work ethic by example and works long hours in coordinating college events such as: honors banquets, picnics, holiday receptions, graduation receptions, and others. There is much more work involved in coordinating such events than anyone can imagine. Rita makes it look easy. She is a force multiplier who not only performs her job in an outstanding manner but reaches beyond her required or assigned duties. She mentors students, student workers, and other support staff. She is always there to provide solutions to diverse problems or volunteers to help out. Her infectious enthusiasm and positive attitude and her true concern for the welfare of the faculty, staff, and students make her a distinguished member of our college and university. Rita is well known and respected across campus as well as in the business community. She is a cornerstone in the College of Business and Technology in making strong alliances within the community. Rita has served on college and university committees; has participated in student organizations; and has volunteered her personal time to them. A few of the organizations that Rita has worked with are the Red Cross, Upper East Tennessee Educational Cooperative, and The Second Harvest Food Bank. Rita’s dedication to East Tennessee State University, our students, and faculty is unquestionable. Thank you, Rita, for being with us here at ETSU! Ms. Jillian Quirante has improved the Chemistry Department in profound and dramatic ways. From the first day of her employment, Ms. Quirante has employed a positive and professional attitude. She has completed additional university leadership training and she has utilized the acquired skills in her day-to-day work. Ms. Quirante independently learned how to manage the Chemistry Department’s website, and she created a Facebook page for the department to communicate with students in a timely fashion. Space does not allow me to list all of Ms. Quirante’s accomplishments, but I assure you that our department has improved by 200% due to Ms. Quirante’s presence, work, and contributions! April Rainbolt joined the Office of Articulated Programs in fall 2002. Since that time she has revolutionized Transfer Articulation, as it is now named. While working as an Information Research Technician, April completed her B.S. degree with emphasis in Digital Media and Computer Science. Her technology expertise has greatly enhanced the information disseminated to transfer students, partnering community colleges, the ETSU community, and the general public. This includes both web and print materials. April is willing and able to do anything asked. She regularly helps with graduation and orientation tasks. She supervises two student workers. In this role, she encourages them to do their best, is patient, and assigns them tasks that are challenging yet in line with their abilities. April is the ‘voice’ of Transfer Articulation. She represents this office and East Tennessee State University in a gracious, knowledgeable manner. Thank you, April, for being with us at ETSU! I would like to nominate Linda Raines in the Graduate School office for her outstanding work with graduate school applications. Her dedication and kind demeanor is truly valuable to the University and her position. Prior to Spring 2011 courses beginning, she worked diligently to help with the acceptance and registration of eighteen teachers from North Side Elementary School who participate with the NSF GK-12 "Science First!" grant and through which are eligible to take a graduate level course each spring. Her outstanding communication in the presence of looming and changing deadlines due to inclement weather was greatly appreciated by all involved. Laura Roberston has been the University School liaison for the Make-A-Wish foundation for a very special cause. Alex is a second grader at University School who is currently receiving treatment for leukemia. A representative for Make-A-Wish foundation contacted Laura about Alex and she has been instrumental in setting up and carrying through his wish. Alex's wish for a two-story playhouse with a "Sponge Bob Square Pants" theme has come to life under Laura's guidance. Laura has lined up volunteers, secured donations from both University School families and local businesses, collected funds, purchased supplies, and helped paint the outside and inside, including the murals. This project has been an enormous undertaking and Laura has given selflessly many hours to this cause that touches us so close to home. The grand opening for Alex's playhouse was November 13, 2004. Representatives from various generous donors were present to show support. Thanks to these donors. Thank you, Laura Robertson, for being with us at ETSU. Billy is a kind, good hearted person. He’s well-liked throughout the university for his kindness and willingness to help anyone. He’s in our building like clockwork everyday ready to work with a smile on his face and a kind a word to share. He’s no stranger to hard work, and does his job with eagerness and caring. It’s not the words he says, but the way he makes you feel. Susan is a dedicated, long-time employee who always displays a kind and caring personality in her relationships with students and others at ETSU. She displays a strong commitment to ETSU on always organizing the design and construction of the Admission’s door decorations for PRIDE week and other major events. She is one of the organizers on the activities for National Day of Prayer, an annual event on our campus. She has dedicated personal time in serving the Animal Shelter to ensure the well-being of stray cats and dogs. In addition, she performs her daily duties in an exemplary manner. Never a complaint regardless of the size and difficulty of the task at hand is one coworker’s description of Susan’s approach to work. Susan quietly goes about daily work and service to the university without seeking any personal acclaim. She is one of the nicest people I have ever known. Kathy Smith is a Legal Assistant in the University Counsel office. She is one of those outstanding employees that could be nominated as Featured Employee for a great number of reasons. Her dedication to her job and the University is quite evident the moment you meet her. No matter what you need, Kathy will stop whatever she is doing to ensure you, the student, community member, or fellow employee, are taken care of immediately and appropriately. She is an advocate for the community of ETSU and demonstrates it through accepting roles outside her normal employment responsibilities. She has served in many roles on Staff Senate, the most recent of which was President. She has also been a pas Employee Giving Campaign Chair. Get involved with her and you will see her positive ETSU community spirit. Kathy shares not only her professional talents with everyone she meets, but her personal talents as well. This is her trademark and most remarkable talent…sharing and caring. Thank you, Kathy, for being with us here at ETSU! Kenneth Smith is a custodian for the Physical Plant. He is very honest and has a great degree of integrity. He has found numerous personal belongings and technical equipment at the Physical Plant while completing his daily routine. He has safely turned in the items to Public Safety or the Dorm Director for safe keeping each and every time. The different types of belongings and property he has found each time have been very valuable. We feel that he should be commended for his actions. We are very proud to have him. Thank you, Kenneth, for being with us here at ETSU! Larry Smith seems to be at just about every ETSU event. He enjoys himself along with everyone else—always friendly—always a smile on his face. But unlike most others at the event, Larry is probably working—capturing moments that convey life at ETSU. You see, Larry is a skilled photographer, and he's taking pictures. Larry Smith never "pictured" the direction his career would take when he received an assignment to Turkey with the U.S. Air Force. His friends convinced him to buy a good camera before he left so he made his first major purchase and learned the basics of operating this unfamiliar apparatus. He quickly fell in love with photography and channeled this passion into a path that led him to a position as director of the ETSU Photo Lab. The Photo Lab made the switch to digital photography when the first digital camera was purchased about two years ago. The digital revolution gives him lots of new opportunities to collect and distribute photos and since the dark room was no longer needed, the photo lab was recently remodeled. Larry looks forward to hosting an Open House in the spring. After 26 years as an ETSU employee, Larry is excited about the future and anticipates continued growth in the field of digital photography. Larry attended ETSU following his four years in the Air Force and concentrated on sports photography. As a student photographer he worked for the campus newspaper, the yearbook, and the Photo Lab. He graduated in the summer of 1978 and began full time work with ETSU that same summer. Larry still loves to travel and photograph sports and his job in University Relations gives him that opportunity. Among his favorite assignments have been several ETSU national championship appearances in basketball, football, and golf. He also enjoys portrait, scientific, and nature photography and appreciates many of the diverse activities that occur on this campus. His favorite hobbies include playing golf and gardening. When away from ETSU, Smith enjoys family life with his wife Linda and their children Daniel, who is currently a sophomore at ETSU, Sarah, and Geoffrey. Attending their children’s many activities is a favorite pastime of the Smith family. They are all active members of New Bethel Presbyterian Church where Larry serves as treasurer. Larry’s care and attention to creative details makes other people's jobs easier—whether he’s taking shots for the web or for print. His love of ETSU shows as he takes just the right shot to capture the moment. Barbara Stokes has been the program coordinator for the Pediatric Residency Program f or quite some time. Barbara has taken on the challenge of being coordinator and has excelled. When candidates f or the residency program call she is the first person they reach. Her knowledge, pleasant attitude and positive outlook have helped everyone to put their “best face for ward.” She transports resident candidates to and from their hotels and to all of their appointments. Many times she must make major adjustments to the itinerary because the physician interviewers are so busy. Through all of this she makes the candidate feel like their day is running smoothly because she adjusts without fanfare or complaining. Barbara helps the candidates feel at home. She makes sure that nutrition and appropriate breaks are provided for all candidates. Making the candidates feel at home is not small feat, because we have a large number of international medical graduates with strong traditions and food choices. Yet, Barbara makes them comfortable. ETSU is blessed to have such a person as Barbara. Thank you, Barbara, for being with us here at ETSU ! Debbie is the Office Supervisor for ETSU at Bristol . She is the den mother for the students and the facilitator for faculty, staff, and visitors. She multi-tasks at the office, keeping track of everyone and everything. She is friendly, helpful, professional, and she keeps everyone organized. She has been with ETSU for 15 years. We at ETSU are very proud to have her here. Thank you, Debbie, for being with us here at ETSU ! It is amazing to watch a fellow employee, Wendy Sutherland, put her heart into the dedicated work she performs. She is called the Freshman Admissions Gate-Keeper!! Granted, help is given her by fellow employees, but still she directs and overlooks all actions made for each person who has applied as an incoming freshman to our campus. To be sure requirements are met, she must evaluate each high school transcript that is submitted. She then computer-loads them - which also helps advisors assist the student in registration and preparation of a career path. Everything, including necessary vaccinations, is noted. The number of freshman increase each year yet she is always answering the phone for associates and assisting other outside office employees who come her way with questions. They go straight to Wendy for their help! Outside the work realm, she collects old cell phones to be donated for re-use by abused women; and, she has been a member of a team that visits nursing homes with animal shelter pets. Her positive attitude is heard on the phone when she calls high school counselors for needed information, and with potential applicants, as well as their interested parents' questions! We are thankful for Wendy Sutherland to be an example of forthright service to this institution by her care, support, and interest she shows each potential student wanting to know: "How much longer until I'm admitted? ", "What else do I need to do? ", and "What's next?" for their beginnings on our ETSU campus. Thank you, Wendy, for being with us here at ETSU! Helping students is Jordan’s job and passion. Jordan Swingle is very much a part of the reason the School of Continuing Studies and Academic Outreach is growing. She does everything possible to ensure a successful outcome for each student she advises. During Jordan’s tenure, enrollment in Cross Disciplinary Studies has increased every year. Jordan is well-respected by her peers and faculty, and she maintains a positive attitude through every interaction. She always has a smile on her face and in her voice. Jordan is a relentless advocate for students. A hallmark of her interaction with others is the care and respect with which she facilitates every student’s progress. Her advisees include military personnel, the disabled, international students, all manner of non-traditional students, and recently, our recession economy is forcing many bewildered, struggling, adults back to college. Jordan works with professors from all departments, athletic coaches, the developmental studies office, and the Adult, Commuter, & Transfer Services Office to ensure that this special population of students has the support system in place to succeed. She is a relationship builder and represents ETSU well to incoming and prospective students. One of the greatest benefits to working at the university is access to continuing education. Over the past year, Chris has taken full advantage of this benefit to earn his Master of Business Administration degree through the AMBA program. While this is no small feat, it was particularly challenging for Chris, who is a father of four sons and who lost his own father early in the academic program. Chris not only persevered through the completion of the program, he kept a smile on his face to the end and was a major source of motivation for his classmates and colleagues. Congratulations, Chris, on a job well done, and thank you for being an inspiration! Brian's job as an Area Coordinator is to supervise and manage Governors Hall. However, during the summer, he also worked in our central office helping with assignments and other functions in Housing Operations. This is not the first time Brian has stepped in to help our department. He is known for his helpfulness both in Residence Life and Operations. I am very thankful to have his help. Brian, we appreciate you! This recognition is well deserved. Larry Tipton is a Locksmith 2 for Facilities Management. He has performed many jobs for us here at the University. Larry always has a smile on his face and is willing to help with whatever task is given to him, even if it is last minute. He never complains and does what he can to help others have a good day. You can always find him telling a joke or two to help cheer up any office. Larry is knowledgeable and proficient in his assigned duties and tasks. He is respectful and consistently produces accurate work. He has a wide range of area to work with on the campus. With his busy load and schedule, he is very efficient and consistently gets to work orders in a timely manner and with a pleasant attitude. Larry's overall commitment is outstanding for the entire campus. He shows extraordinary commitment to the University community. We consider him an above average worker and an outstanding employee through the services he provides. Thank you, Larry, for being with us here at ETSU! I have had the pleasure of working with Joel in my role as a new advisor. He has been very patient with me during this new learning curve and has been a wonderful teacher and mentor. Joel is very knowledgeable about the College of Education programs and does his best to work with program coordinators to ascertain any new changes in their programs so that students and our office know what is happening with the majors. He is always thinking of ways to communicate with students so that they are not left out of the loop. He is very diligent in answering emails from students in a timely manner so that they can make decisions about classes and boarding. As programs have evolved over the years, Joel has been here long enough to understand when substitutions for classes can be made and who needs that information to help the student graduate without any last minute problems. Joel spends many hours working with the cohort students as Walters State Community College and Northeast State Community College. All of these programs have similarities but students enter at different times and since there are so many cohorts it is hard to keep up with who is where in what program. He meets with these students individually and presents to their classes so that they have correct information to continue in the cohort or for transferring in to our education licensure programs here on the main campus. There is never a slow time in the student services office and Joel and I are always working on new ways to communicate with or help students understand the steps through teacher education. Our main focus is to assist students with the process and give them accurate information so that they leave our office understand what they need to accomplish and do not have to keep returning for the same information. Joel works closely with our graduate assistants in creating surveys for future feedback and checklists that help keep students on track. All information on students who board is data tracked for statistical purposes and Joel oversees this process. We spend time traveling and attending recruitment programs and Joel makes sure our materials are up to date for these events. I appreciate the fact that Joel is so dedicated to his job and the College of Education and maintains a good reputation with our students and staff. I think he is very deserving of employee recognition. Joan is a team player extraordinaire. She cares for every person, provides assistance to anyone needing help, and graciously does whatever it takes to get the job done. She comes to work early, stays late, and NEVER complains. She is energetic, motivated, and has a positive approach to work and life. She is the first to volunteer to help and is always willing to take the extra steps necessary to complete the project in an exemplary manner. She combines a positive attitude with a winning personality and a genuine concern for others. She steps up to assist in any function of Enrollment Services. She is positive, energetic, and never fails to be kind and helpful. She serves as a role model for Enrollment Services. ETSU is fortunate to have her as an employee. Richard Wallace, a Coordinator for Outreach Services at the Quillen College of Medicine, goes beyond the call of duty by writing numerous grants. He performs outreach workshops across the state. He has a high service mentality and stays abreast of the latest in healthcare technology. He has been named a 21st Century Librarian by Syracuse University. He has also been featured in the Library Journal as a “Mover and Shaker”. He serves as President of the Boone Tree Library Association. He was also named the “2003 Academic Librarian of the Year” by the Medical Library Association. He exhibits a positive attitude and image of the University. He is always willing to listen to his staff and their concerns. Thank you, Richard, for being with us here at ETSU! Some may know him as the “Yo Ho Ho Rapper” from the 2015 Student Affairs Holiday Social; others may know him as the man who creates fun underwater videos or the guy to organize major concerts at ETSU. Carter Warden truly goes above and beyond in his job duties - joyfully and generously devoting his talent to the SORC Team, the Division and the University. Once a few people became aware of what he is capable of, the requests for his help started rolling in. He has worked on videos and designed posters for various departments. He sang the national anthem at a ballgame and participated in the “So You Think You Can Sing” competition with Athletics. During the summer of 2014, he filled in as the coordinator for New Student Orientation and in the spring of 2016 he took on the temporary role of director for SORC operations and events. He accommodates all of this on top of his many responsibilities in the SORC. And the case could be made that his job requires more dedication than most because the work often means very late nights, long weekends and doing things like white washing the Pride Walk asphalt every time our students are ready to re-paint it. Meanwhile, he is always joyful, never begrudging and so much fun to work with. We are very fortunate to have him on our team! Jennifer Webb is an executive aide in the Adult, Commuter & Transfer Services office. Greeting students with a bright smile, Jennifer is consistently helpful to students visiting the office and the ARC. 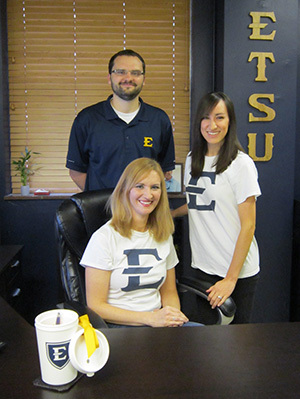 A graduate of ETSU's College of Business, Jennifer clearly loves ETSU. Her knowledge of student services and of ETSU enables Jennifer to give top notch and friendly assistance to students seeking answers to questions. Over the past three years, Jennifer has discovered a new interest in event planning, playing and integral role in the production of the ETSU Homecoming Fall Festival. Her enthusiasm for this major campus event is contagious! In addition to this event, Jennifer plays an important supporting role in planning Commuter Appreciation Days and Movie Nights for our adult students and their families. Jennifer's appreciation for Student Affairs work has provided encouragement for her to pursue graduate studies in this area. Jennifer is a member of the Master of Professional Studies/Strategic Leadership Concentration. Those who work with Jennifer appreciate the hard work and high energy she brings to everything she does. Thank you, Jennifer, for being with us here at ETSU ! I would like to nominate Amy Weber for job performance above and beyond the call of duty. Amy is a Scientific Equipment Technician in the Department of Biological Sciences who coordinates delivery of our majors and non-majors biology laboratories to over 1,000 students each week. Amy organizes, purchases supplies and equipment, makes sure that the labs are set up correctly, and troubleshoots any issues that arise, while also coordinating the more than 20 graduate assistants who teach the labs. She consistently performs these tasks with efficiency and her efforts greatly enhance the student experience in these classes. Amy also filled in as acting executive aide during the spring semester and approached this additional responsibility with characteristic enthusiasm. She helped us come through an external review with flying colors. Amy regularly takes on tasks she feels will help the department, such as reorganizing our departmental accounting system which has greatly improved our efficiency. Amy is always willing to help students and faculty members alike and we appreciate her efforts every day. She is an exemplary ETSU employee and deserves recognition! Ruthie Wheeler has been at ETSU’s College of Medicine for over 25 years. She is always friendly and eager to assist students. She went above and beyond her duties by assisting students of ETSU’s new College of Pharmacy in securing financial aid to help with their first year. Ruthie took the lead in customer service by assuring that students have completed their financial aid forms, student awards were processed and their funds were received and disbursed in a timely matter. Great job! Wendy has been with the Gatton College of Pharmacy (GCOP) from the day we opened our doors. Starting out with us in the dean's office after serving many years in the Quillen College of Medicine, she had been recognized by pharmacy and medical students multiple times for her dedication to the colleges. Wendy is always eager to provide the highest quality service to students, staff and faculty. In her current role as GCOP Admissions and Records Coordinator, she also assists prospective students and is ready with a warm smile and encouraging word. The main reason we keep her around, though, is her sharp wit and fabulous sense of humor. Wendy exudes positivity and professionalism, and she makes it a pleasure to come to work each day. Sandra Whitaker is an Office Supervisor in Family Medicine. She gives 100% all the way around. She truly cares about the patients that are served, as well as the faculty, physicians, residents, nurses and front office staff. She goes out of her way to make everyone feel comfortable. Sandra needs to be recognized for the countless hours she spends caring about everyone that she comes in contact with. Thank you, Sandra, for being with us here at ETSU! Connie Yakley is an Executive Aide in the Counseling Center. She is the hub that makes the Counseling Center wheel turn. She is exceptionally dependable, so much so that the Senior Associate Vice President asks for her assistance on some of his own office related matters. She is currently assisting Dr. Bader in several areas while he recruits a new staff member and this is in addition to her regular job responsibilities. Connie has been with the University for about nine years and is one of those essential individuals who not only knows how to maneuver through the University, but also has established strong relationships that help her do so. If something needs to be done, Connie can figure out how to do it and who can do it best. She can brighten up any day with her wonderfully unique sense of humor and always delights others, taking advantage of every situation to lighten the moment. Connie drives about 55 minutes each day from Kingsport where she cares for her father, yet she is the first to arrive every day. The Counseling Center just wouldn’t be the same without her. Thank you, Connie, for being with us here at ETSU!